I have recently seen several ads for Gentleman Jack on the internet and the television, so I thought I should get a review of this one so you can decide whether you want to spend your hard earned money on this Tennessee classic. As I mentioned in my review of Old No. 7, Tennessee whiskey is notably different than bourbon because the whiskey is charcoal filtered prior to going into the oak. The whiskey comes right off the stills and goes through a charcoal filter, smoothing the whiskey out and extracting possible contaminants. This might seem like a great idea, but it isn’t all great. Just like chill filtration, charcoal filtering runs the risk of extracting flavor in addition to contaminants. 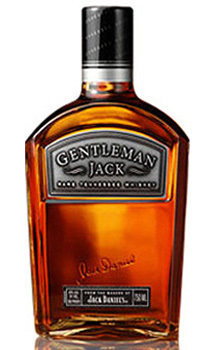 Gentleman Jack is different from the classic Old No. 7 in that Gentleman Jack is filtered through the charcoal twice. The result of that second round of charcoal filtration is that Gentleman Jack is ludicrously drinkable. I hate to use the word “smooth” to describe whiskey, but Gentleman Jack fits that bill perfectly. Not surprisingly, it is bottled at 80 proof, but it drinks like its the same strength as a sherry or a port. Be careful with this stuff. Drink it responsibly. It can spiral downhill quickly with this luxuriously smooth Tennessee whiskey. Now that my warning is out of the way, I can give you my notes. On the nose, this smells a lot like Jack Daniel’s Old No. 7, but a bit weaker. That banana thing is still going on, with some honey, corn, and oak, but it is not the rich nose of Old No. 7. On the palate, this whiskey is a whisper. It is soft and a little watery. It is mostly sweet, with a little vanilla and honey, and maybe a little bit of banana. The finish barely even exists. Seriously, I had to remind myself I just drank whiskey. Honestly, there might be some oak, but there isn’t much in this finish. Overall, the highlight of Gentleman Jack is its drinkability. So, if you have a friend or significant other that has been looking for a drinkable whiskey to have at a party, look no further than this one. If you are a connoisseur of port and you want to expand into American whiskey, this one is a good place to start. If you love Wild Turkey, I don’t think Gentleman Jack will be up your alley. But, as always, try it for yourself and let it ride! My grade: C-. Price: $30-35/750ml. A nice, drinkable whiskey, but it is definitely not on my list of whiskeys to buy at that price point. Jack Daniel’s is probably the most iconic brand of American whiskey. It is the fourth best selling whiskey worldwide, and its iconic bottle design and logo have been re-appropriated countless times. Due to several unfortunate experiences in my college days, I have refrained from reviewing Jack Daniel’s for some time. However, in an effort to confront my past, I am taking the time to review Jack properly and responsibly. Jack Daniel’s is not a bourbon because the whiskey is charcoal filtered before it is placed in the barrels for aging, which disqualifies it from being a straight bourbon. Just because something is not a straight bourbon does not mean that it is any better or worse of a whiskey; it is simply different. In Jack Daniel’s case, the charcoal aging gives the whiskey a smooth, mellow mouth feel, which comes out even more in Gentleman Jack. As for Old No. 7, it is quite a unique whiskey. The nose is truly distinct. It mostly smells like banana caramel cream pie. There is some oak and corn to support it, but the most dominant aromas on Jack Daniel’s are banana and caramel. On the palate, the whiskey has a wonderful, viscous mouth feel. The same flavors of banana, caramel, and corn are replicated on the palate just as they were on the nose. The finish is sweet, with caramel and corn being the primary players. Over time, the lingering flavors move to a deeper oak and some bitter-ish tannins. Overall, Jack Daniel’s is a very distinct and unique whiskey. Personally, I am not a fan of it, but there are plenty of folks on the planet who claim that Jack Daniel’s is whiskey. I am not one of them, especially since Jack Daniel’s usually costs about $25 for a bottle. My grade: D. Price: $25-30/750ml. At that price point, there is a laundry list of whiskeys I would rather drink than Jack Daniel’s. However, don’t take my word for it; try it yourself, and let it ride!